Price: SOLD OUT. Waitlist only. Oscar Edward Cesare, Swearing Allegiance to Liberty on Entering the Country, ca. 1910. Collection of the Museum of the City of New York, 56.98. This day is presented in collaboration with the New York City Department of Education as part of NYCDOE Chancellor’s Conference Day for High Schools. Immerse yourself in the Museum’s exhibitions to learn how immigrant communities have both shaped and been shaped by New York City. 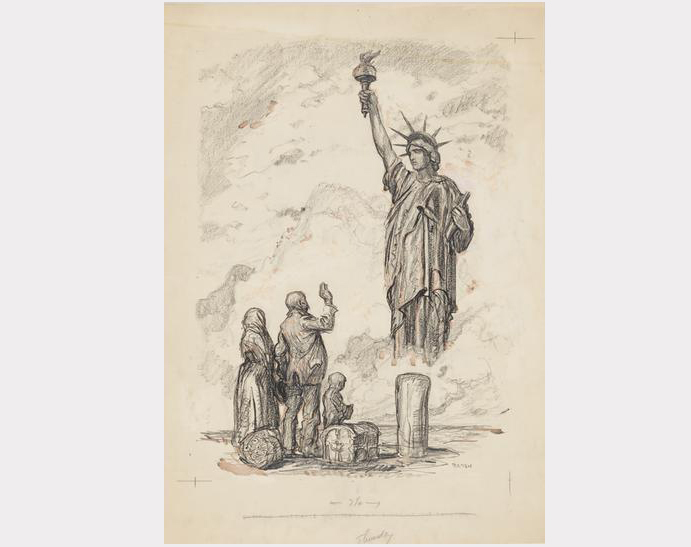 This day is presented in collaboration with the New York City Department of Education and will include a hands-on workshop with the app The New Immigrants: NYC 1880-1924. This Chancellor’s Day workshop will also include a primary source workshop and guided tours of the exhibitions New York at Its Core and Interior Lives: Contemporary Photographs of Chinese New Yorkers. The Museum of the City of New York is a certified CTLE provider. Participation in this full-day program provides 5 hours of CTLE credit. Free. Registration required. This program is now sold out. All participants must register individually. The Museum is grateful to The Andrew W. Mellon Foundation, which supports a Predoctoral Fellowship Program in Public History.